Home/Knowledge Base/What is Vetrazzo made of? Vetrazzo is one of the most eco-friendly surfacing option on the market today. Vetrazzo slabs are made of 100% post consumer recycled glass and is set in a cement binder, not a petroleum resin binder. 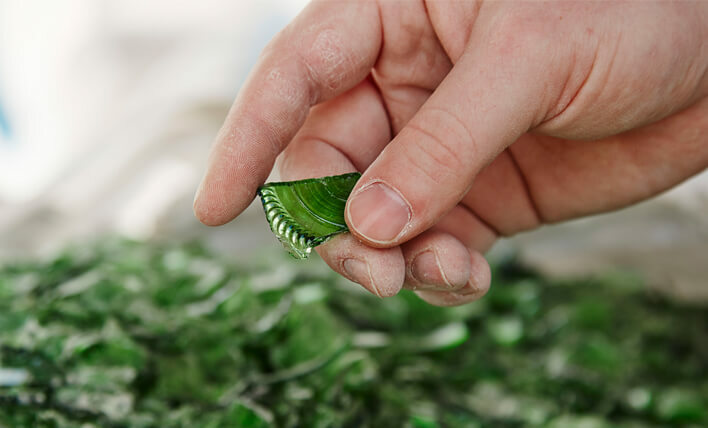 As you can see below Vetrazzo is made from Skyy Vodka bottles, art glass production overruns, red gobbles, wine & beer bottles and clear bottle glass. Other unusual sources include window shields, shower doors and salvages windows. VETRAZZO IS A PRODUCT OF AMERICAN KNOW-HOW – ALWAYS PROUDLY MANUFACTURED IN THE USA. Each Vetrazzo slab is proudly produced by hand in Tate, Georgia, USA, and each is a masterpiece of engineering, design and sustainable development. Our precious sources of glass are carefully chosen in a process that calls for painstaking research and meticulous quality control. 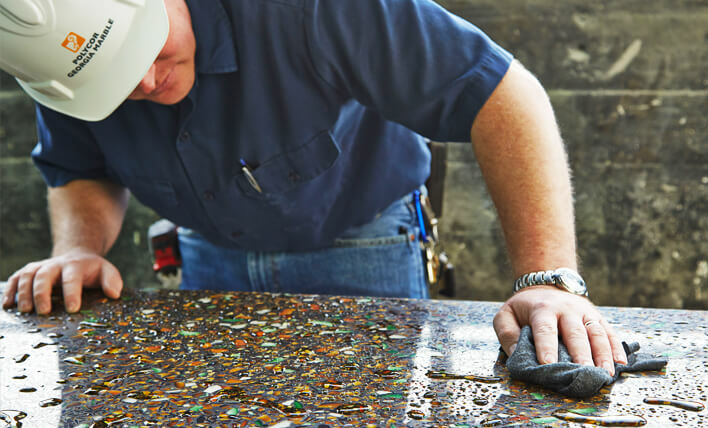 The pieces of glass are introduced into the composite and placed by hand to ensure the smooth, uniform surface that enhances the beauty of the finished product. Each Vetrazzo slab is a unique, artisan-made product that has been handled with care and expert attention to detail. 8 different people work on the fabrication of each slab. Each glass mix is produced on-demand for each slab. During the fabrication process, glass pieces are crushed and meticulously chosen to create a harmonious blend. This is a work of art! To make sure that each piece of glass is correctly placed, the slab then goes onto a vibration table. The recipe for each color is prepared with consistency and precision: such precise factors as humidity, the weight of ingredients and temperature are carefully measured. Each slab is inspected and polished four times to eliminate any possible imperfections. The slab is then dried for 1-4 weeks.